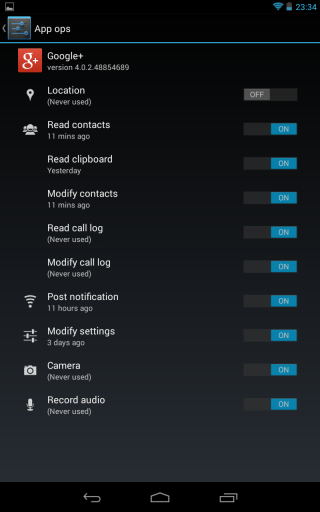 App Ops is a hidden application activity in Android 4.3 that lets you manage the permissions used by apps. 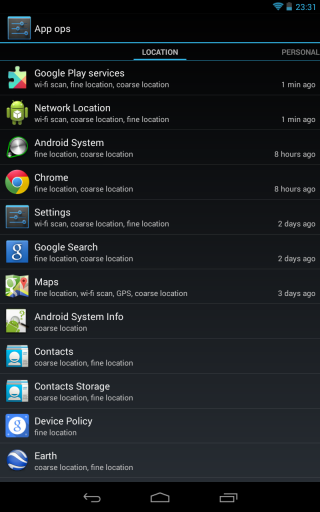 It was found by Android Police and there's a Google Play app that launches the permission manager (no root required). I tested App Ops Starter on my Nexus 7 (2012) and it works. There are 4 permission groups: location, personal (contacts, calendar, call logs), messaging (read/write/send SMS) and device (notifications, camera). Each tab shows a list of applications sorted by the time when they last used one of the permissions. App Ops also shows the permissions used by each app. You can disable permissions for each app you've installed and even for system apps. Sometimes disabling permissions didn't have any effect, other times it worked. For example, I disabled the "read clipboard" permission of the Google+ app and the application no longer suggested the link I copied to the clipboard. I disabled the "location" permission of Google Maps, but the app could still detect my location (I had to disable the Play Services "location" permission to prevent Google Maps from finding my location, but this affects other apps). For now, Android apps aren't optimized for the permission manager and disabling permissions could have unexpected effects: the apps might crash. Android's permission system encourages developers to add as many permissions as possible, even if they don't currently need them. Maybe they'll use them in the future, so it's better to add them and make sure that the app updates automatically. 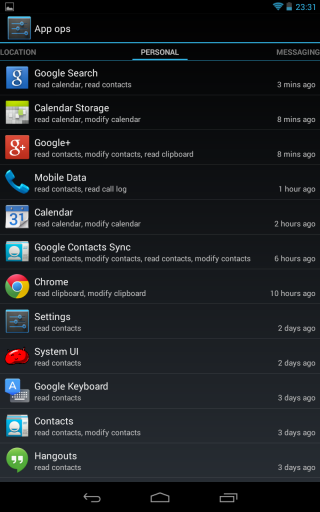 Android's permissions are all-or-nothing, few bother to read them, even fewer understand them. Google should have done a better job here: encourage developers to use permissions sparingly, allow users to revoke permissions, add opt-in permissions like in iOS.﻿ Maybe App Ops will fix some of these issues when it will be officially available, probably in Android 5.0.